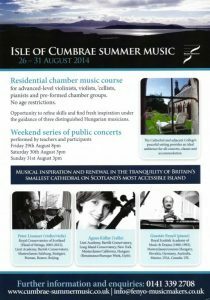 In 2013 and 2014, Music-Makers presented Isle of Cumbrae Summer Music, a residential course for classical musicians, combined with a series of public concerts. 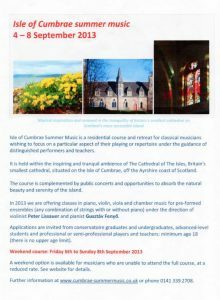 The course had the two-fold aim of providing guidance to participants, either aspiring or professional musicians, in daily classes led by outstanding performers and teachers, as well as ensuring time and space for renewal and fresh inspiration in this especially tranquil setting. 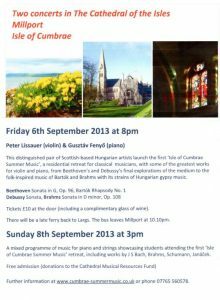 Participants were also given the opportunity to perform in one of the public concerts. 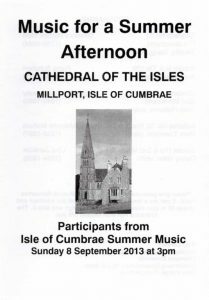 Concerts and classes were held in the Cathedral of the Isles, reputedly Britain’s smallest cathedral which is situated on the Isle of Cumbrae, while accommodation was provided in the adjacent College buildings, originally intended as a seminary and now a 3-star guest house. 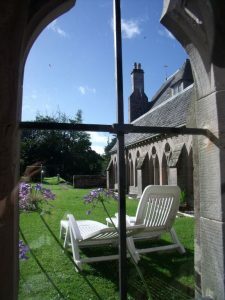 The Cathedral and College are set in eight acres of ground and regularly serve as a place of retreat for individuals and groups. 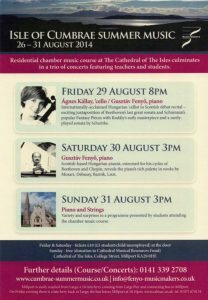 The Cathedral has a rich tradition of sacred and classical music, including an established series of Sunday afternoon concerts throughout the summer. 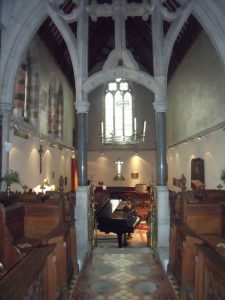 The Cathedral and College also house a number of keyboard instruments, including a fine Bösendorfer concert grand piano. A further reason for our choice of this place for our Summer Music venture was the island’s location. 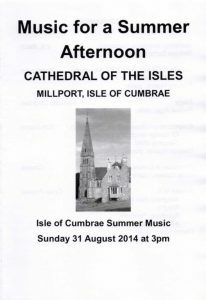 Cumbrae is often described as Scotland’s most accessible island, since only a ten-minute ferry crossing separates it from the busy North Ayrshire town of Largs, which has fast road and rail links with Glasgow, only 32 miles away, and other centres. While the Cathedral, College and grounds provide a haven of uplifting quietude, they are within walking distance of the centre of Millport, the island’s only town, which retains much of the charm of a Victorian seaside resort. The Cathedral of the Isles and College of the Holy Spirit were founded by The Hon. George Frederick Boyle, later 6th Earl of Glasgow. 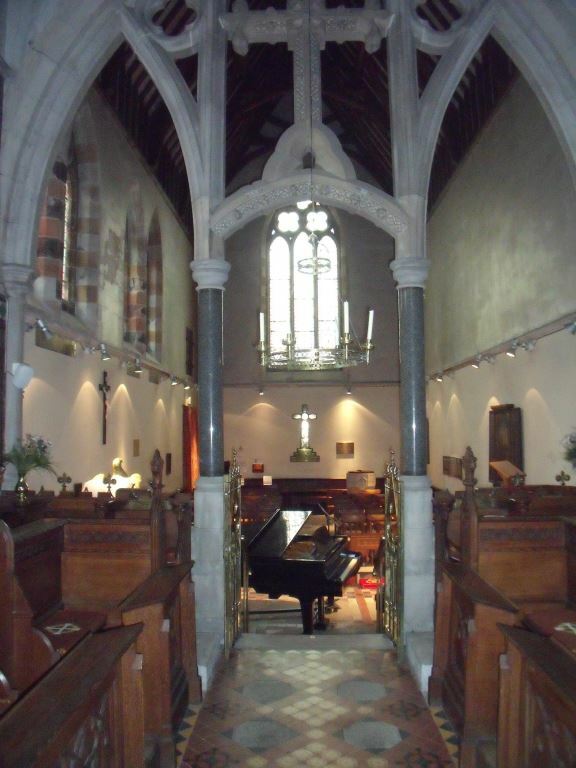 They were completed in 1851 to designs by the renowned Victorian architect, William Butterfield, whose other works include Keble College, Oxford, All Saints Margaret Street, London and Melbourne Cathedral. The Cathedral is an architectural gem of excellent proportions. Its interior contains fine examples of brightly-coloured tiles and stained glass windows, hallmarks of Butterfield’s style, while the chancel ceiling depicts the variety of wild flowers found on the island. The Isle of Cumbrae is the larger of two islands in the Firth of Clyde known as the Cumbraes, which are sheltered from the Atlantic by the Kintyre peninsula. The island offers peaceful settings and stunning scenery. It is rich in wildlife, including 120 species of birds, and a haven for wildflowers and ferns. A quiet coastal road winds around the island’s eleven mile circumference, giving access to sandy bays, while an inner route leads to the island’s summit of 417 feet, rewarding with glorious panoramas of the larger islands of Bute and Arran to the west.